We know two different specification types, one is that client gives by ordering a new web project, and other is technical project documentation which is created by web design agency when taking client specification. This article is dedicated to ones who want to engage a web design agency for creating a website or a web application, and also as guide for web design agencies which doesn’t have defined methodology jet. It is often case that when client order a website, there is not enough specific and crucial information which are very important both for client so he can comprehensively examine their own project, and for a web design agency so it can create offer, considering all demands, wishes and to obtain clear picture of the client’s needs. It is very rare case when client provide serious project documentation which tells precisely about all demands, project description, process flow and provides clear picture about what is expected. Considering this, in this article you have 10 key items/elements which will help you to create a specification. Also, on the bottom of this article there is an example of blank document/specification which is filled by clients, and one example of filled documentation. It is very important that web design agency get to know with purchaser’s activities, his current presentation on the market, his marketing goals and strategy, so it can be integrated in the potential project. 2. Is it completely new project or it is redesign/reprogramming of existing one? What is the web address of that website? Do you want a website redesign or completely new website? If you already have a website, link for it will be very helpful so web design agency can get to know with currently structure of website and activities. 3. What do you concretely expect from a website? Expectations from a website determine the way of its creating. This information can be useful for getting known with client’s wishes and where you should put most focus. Very useful information is when client delivers link for websites which are closely relative to his expectations of his future website with design and functionalities. 4. Which type is your website? This information is very useful because it tells us which potentially CMS platform should be suitable or if it is for custom solution. This data tell us what program language should be used and which framework. What is the number of webpages? Is it single language or multi language website and what is the number of languages? It isn’t same if you want website with 4 pages or a website which has thousands of pages. Site with 4 pages also can be very complicated in terms of dedicating attention to every detail on the page and high quality design. Web packets aren’t the best solution for clients. They doesn’t precisely define client needs and purchaser or agency can be very easily damaged. If in web package is stated that number of the pages is unlimited or 50+, and you sign contract, then it isn’t defined how much you really have to work. It is very important not to approach website creating like “stamping” of the pages/segments. Every information is important, every layout has its purpose and for every detail attention should be dedicated. Homepage is dominant page, but it is needed to dedicate attention to all other pages. Who will do importing of the content on a website (purchaser or agency)? Does site needs a CMS system so purchaser can import content? How often do you plan changes on site and what elements would you change? If purchaser wants presentation which doesn’t require changes, then there is no need for creating CMS system or using some platform. First of all, client doesn’t want to pay for that, he doesn’t need that, popular platforms has vulnerability. In reality 99% of purchasers except that their website is dynamic so they can change its content, so it is needed to plan a training for them. This is one of the crucial items. At this point it is necessary that purchaser provide as much as it is possible information about the functionality itself. So, every functionality and phase/flow are explained and on basis of that it is possible to create offer and eventually sub questions. One of important information is that if website has to be responsive, adjusted for all mobile devices. This functionality has become standard and it’s almost considered as default functionality, but it is needed to discus with purchaser about that, because there are exceptions and different demands. Information about budget which you plan to invest in potential project, may be indicator for agency about seriousness and how much you really know about the price for that kind of services. Many purchasers avoid to define their budget, and expect that they will get offer first so in that way they «doesn’t show their cards». However, by telling your budget you are providing agency with possibility to tell what is possible to make within that budget. Price isn’t being calculated on basis of client’s budget, but on basis of demand, so if it is project which cost 900 euros, and client defined budget of 5000 euros, price will be 900 euros, but information about budget will be used to give additional offer to client and tell him what is possible to do to improve the project. Also if real price for project is 2000 euros, and client defined budget of 1000 euros, it is possible to make offer within that budget, which will be without some items that increase price of creating project. Because of that we suggest as solution to provide approximate budget, (from – to). That is very useful information in tactic and informative way and it is favorably for both sides. Deadlines are very important factor that greatly impact on intern work distribution, sorting project by priority and price. If you don’t have defined Timeframe, a deadline, then project is created in standard regime and that deadline isn’t defined doesn’t mean that the project will be created out of real Timeframe. Project defining is directly associated with project documentation and in 99% of cases, web design agency is the one who establish approximately deadline for that project. If purchaser demands that project has to be out of real timeframe then it is needed to work overtime, and that will affect the final price of the project. Additional information can be used for everything what isn’t cited in previously items or something what is off topic and provided questions. I hope that this will help to ones who want to offer service, and to web design agencies who had problems with this topic. Founder at PopArt Studio d.o.o. PopArt Studio Featured in Clutch’s Research - 7. February 2019. 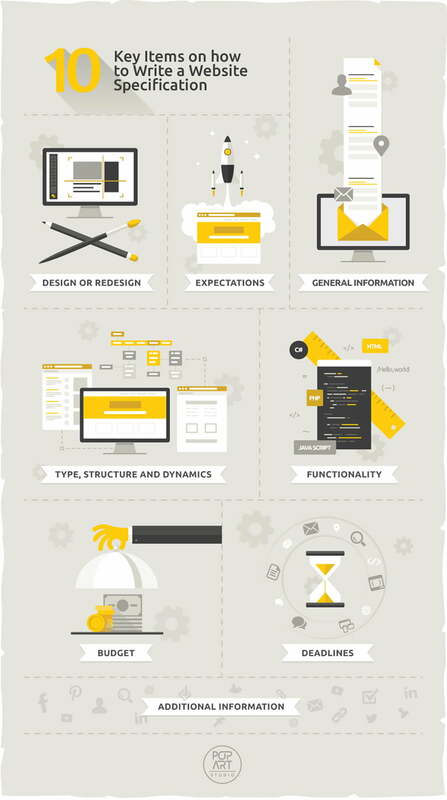 10 Key Items on How to Write a Website Specification - 13. February 2015. Merry Christmas and happy New Year - 30. December 2014.